I’ve been asked to speak tonight about diet. Even following a vegetarian diet, you can still be much more controlled by your tongue than by your intelligence. And I think most people will agree with that. – Oh, I like this! So, I want to eat this. – But it’s not that good for you! – But it’s not meat, fish, or eggs. It must be all right! It is offerable, and if Krishna accepts it, it’s prasadam. But there are different effects on the physical body according to the food we eat. Krishna has arranged the body in such a way that it’s designed to be healthy. It’s designed to be healthy; it’s not designed to be sick. So, if it’s designed to be healthy but many times it’s sick, it means we are doing something wrong. It means we are not following the design. So, there are many things that contribute to good health, but diet is probably the most important; it has the most effect. Every nutritionist on the planet will agree that the body should be alkaline. Does anybody know Ph scale? Is there anybody who doesn’t know? If you went to school, you probably know. Anyway, there is a chart (I guess, it’s called a chart), it goes from 0 to 14, and this is called the Ph scale. Ph stands for potential hydrogen. But it’s set up like this: 7 is in the middle. It goes from 0 to 14, so 7 is in the middle. If the Ph of a substance is below 7, it’s acidic. The further below 7 it is, the more acidic it is. So, Ph of 6 is more acidic than 7, Ph of 4 is more acidic than 6, etc. And it’s a geometrical scale. So, one point on the scale from, let’s say, 6 to 5 increases 10 times. So, acidity of 5 is 10 times more acidic than 6; 4 is a 100 times more acidic than 6; 3 is a 1000 times more acidic than 6, etc. Did you get the point? Ok. 7 is neutral. And above 7 is alkaline. And the higher you go, the more alkaline it becomes. What does this have to do with the human body? 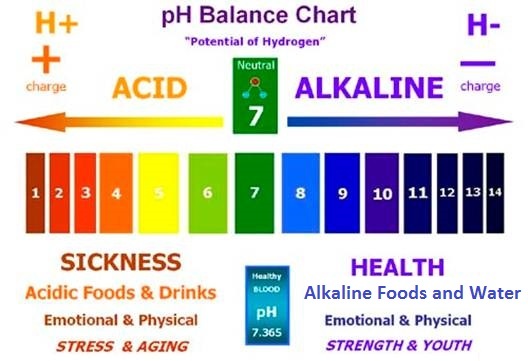 The human body by design is alkaline. But by practice, in most all cases it’s acidic. And this is a big problem. The human blood in it’s perfect state has a Ph of 7.365. This is an optimal Ph of the blood. The blood must stay within a very close range to that, or there are big problems in the body. If it goes like… I do not know exactly the figures. But if it goes to, let’s say, 7.5 or 7.2 (not very much), you die. The blood has to be within this very narrow range. The body’s designed to live, not to die. Well, it does die, but… The body’s designed to live and then later die. So, the body does everything it can to keep the blood within that range. There are all kinds of defense systems built in the body to achieve this. The main problem is acidity, not alkalinity. So, the body has certain buffers in reserve: calcium, sodium, magnesium, potassium. They buffer the acid. In other words, they neutralize the acid. So, if you eat acidic food, the body has to neutralize this acid in some way. And it will use up the reserves that are designed for this purpose. And then it starts taking calcium (or potassium, or magnesium, or whatever) from other parts of the body. It has to do something to keep the blood in this range. So, let’s take calcium, for instance. To neutralize the acidic blood, it will take calcium from the bones, from the teeth. What does it to do to your bones? It depletes the bones; the bones get very brittle, very weak. What does it do to your teeth? It makes them more susceptible to decay; they’re becoming more fragile, wearing away very quickly. I’ve had terrible teeth my whole life. And nobody’s ever brushed their teeth or flossed the teeth more than me, and I stayed up late at night to do it. So, now I can understand why. But I could not understand it before. I was raised on a farm. I had cows, I drank milk from the cow. I did everything, but my teeth… were junk! One reason is karma. I mean, you have to remember that there is karma, so you can’t defeat that with alkaline diets; that’s not going to work. But we can do a lot to improve our health condition. According to Krishna’s original arrangement, the whole environment in the material world was alkaline, basically. What causes acidity in the body? One, of course, is food. It’s unique that as soon as you start to chew and break down even the alkaline food, that breaking down process creates acid. The mouth has bicarbonate of soda in it that comes in with the saliva to alkaline that acid which is produced from chewing. But if this food is acidic, obviously it has to take more bicarbonate to do it. So you don’t have enough. Do you understand the picture here? Anyway, I do not want to get too far with that. So, what causes acidity? Food. Exercises. When you exercise, the working of the muscles creates lactic acid. That’s why athletics get “sour” muscles: the lactic acid builds up. That’s why they get fatigued. So, there is acid in the body from exercise. There is acidity caused in the body by what we think, what is our mood, what are our emotions. Worry, depression, mental stress, anxiety create very big acidity in the body. Any kind of pollution: air pollution, water pollution, all kinds of chemical pollution in food (not even the food, but the chemical pollution) creates acidity; sound pollution also. Any type of pollution that we are exposed to creates acidity in the body. So, is it any wonder that our bodies are acidic? Everything is creating this. Not enough sleep, and I’m sure that all this electronic smog, computers and cell phones, and cell phone towers, and infrared towers, and all this stuff create acidity in the body. But did Krishna design the system to be so contaminated? No, He didn’t. He designed a clean environment. That’s why I say the whole environment basically was alkaline, not acid. There wasn’t all the stress, the anxiety, the worry, the misery. People were calm and relaxed. They weren’t always worried about everything. “What do you worry about?” “Everything! I can’t relax at all, anywhere, at any time!” In that environment all this acidity didn’t take place. We call it Krishna’s environment. Now we have Maya’s environment; it’s very acidic. Maya is really acidic. Water is the most important thing of all. When our bodies are born, they are about 80 to 85% water. That’s why babies are so juicy. They are juicy. You can see it. But as we grow and become adults, then it’s about 70 to 75% water. When we get old and it becomes dried out, that’s 60-65%, even 55%. And that’s why old people look like prunes. They are dried up. Everything becomes dry, that’s why constipation is such a problem. There is just no liquid at all; they’re all dried up. So, the water we drink is very, very important. One: the volume of water. We should drink at least 2 liters a day (very, very minimum). 3 to 4 liters are preferable. And the water should be good. Good water? Good luck! It almost doesn’t exist. All these bottled waters basically all are acidic, even the famous ones. I have a Ph meter and we measured “Borjomy”. What was it? 6.2-6.3, or something. So, this is a problem. There are ways to increase the Ph of the water by adding drops that increase the Ph (Ph drops), by adding salts (sodium, potassium, calcium, or magnesium chlorides). There are sticks you can get that contain certain minerals inside; you put them in the water and this increases the Ph. But a lot of people are not going to do that. It can be a bit expensive; it’s a kind of hustle. A lot of people are not going to do that. If you do it, there is a great benefit, but each individual has to decide on that one. But the point is – at least don’t drink tap water. Get some water that’s somehow filtered to get the chlorine and all the things out of it. In Krishna’s system, you are supposed to drink from the streams. You just go down to the stream and drink perfectly pure, clear, alkaline water. The water runs over all these rocks which contain minerals that alkalize it. One of the places on the planet where people live the longest is the Hunza Valley in Kashmir. The water they drink comes right out of a glacier. And it is so full of minerals that it looks like milk. They call it “glacier milk”. That’s the water they drink, and these people live very long. A hundred and fifteen, a hundred and twenty years old are common. I’ve heard a lot of western influence’s going there today and now it’s not like that but that’s where it was. Do the best you can. Drink the best water you can and drink a lot. It’s very easy to drink 3-4 liters a day if you are always drinking. I carry water with me all the time. You may have noticed that. And I’m not just carrying it around – I drink it, too. You start from early morning when you get up, and you drink throughout the day and by the end of the day, and no problem; it’s easy. That’s very important. You can’t be healthy if you don’t drink enough water. So, water is very important. Then – food. We are vegetarians, so we’ve already eliminated the meat, the fish and eggs. Really, fish is not so acidic, but meat and eggs are very acidic. The authorities on this subject say that eggs are the worst. If you eat 1 egg, it takes the body 72 hours to clean the contamination out of the blood. 1 egg! But we don’t have to worry about that, we do not eat eggs. So, we are ahead. Now, let’s look at what foods we do eat. One thing we eat is grains, almost every day. So, there is basically only 4 grains that are alkaline and low alkaline (but still alkaline or just almost). They are millet, buckwheat, spelt (which you don’t have here), quinoa, and amaranth (if you can find that). The rest of the grains are acid-forming, especially wheat, rice, especially white rice. All the refined grains are the worst. So, if you eat rice, eat Brown rice or Brown Basmati rice. The whiter it is, the worst it is. If you are going to eat wheat, it should be whole wheat, not refined flour. But better if you do not eat it at all. Many people have allergies to wheat. Many, many people. They don’t even know that they do. It causes all kinds of problems, and they don’t know why, what’s the problem. And it’s just because they eat wheat. They are addicted to bread. There are so many people feel like they can’t eat without bread. I mean, I can remember that for long periods of time I even couldn’t eat a meal without bread: “Where’s the bread?” It’s not good for the body, I can tell you. “But I like it!” Maybe, you do. But that does not mean it’s good. So, again, the grains: quinoa, buckwheat, millet, spelt and amaranth. What else do we eat on a regular basis? We eat vegetables. Some vegetables are alkaline, some vegetables are acidic. Let’s understand one thing first. Sugar of any kind however you get it, in any way, ultimately becomes acidic in the body. All sugar. When it breaks down to glucose and all that things, ultimately it causes acidity in the body. So, to achieve optimum alkalinity for the body, sugar should be completely eliminated or greatly reduced. That means all cane sugars (I do not care if they are the best natural dried cane juice), beet sugar, cane sugar, honey, agave syrup, maple syrup, birch syrup, or whatever; all of those. They are all sweet, they are all sugar, they all form acid in the body. “But I like them! I like sweet things!” You get what you get. But I can tell you this from personal experience of myself and quite a few other people: the more acidic the body is, the more cravings for sweet things we have. But the more alkaline the body becomes, the more we lose that craving; we are not attracted to it. And something that is not very sweet tastes so sweet! Your taste changes. When you hear this, you might say: “I could never do that! I can’t give up this! I can’t stop doing that!” But when your taste changes, you can easily give it up. You don’t even want it. So, again, don’t think that things can’t change. They do change. Ok. So, back to the vegetables. Some vegetables are very sweet. They contain a lot of sugar: beets, carrots, winter squash – they’re all quite sweet. Potatoes are not so sweet, but they have a lot of starch which ultimately turns into sugar. So, those are not the best for an alkaline diet. The best thing is green vegetables. These are full of calcium, iron, magnesium. They are very alkaline. They are very cleansing. They are filled with minerals, very nutritious. All the leafy green things like spinach, and lettuce, and chard – green leafy things. Let’s just say – leafy things. They are very, very alkaline, very good. Dill, and parsley, and basil, and all these things; cucumbers are also very good; tomatoes are excellent; zucchinis, all the summer squashes. We don’t eat them, but onions and garlic are also very alkaline. Broccoli is very good. I can’t think about all, there is a whole list. You can find and get that list. Cabbage…Oh! Beautiful cabbage. Russia would be dead without cabbage. Cabbage and potatoes. Without that, you got no Russia and Ukraine. Eggplant is Ok. Etc. Stay away from the sweet, starchy vegetables. Not completely away, but understand where they are in the scale. If you cook potatoes, cook them in water, and when the white foam comes on the top of the water, pour that water off, and you will get rid of most of the starch. Then the potatoes are much better. Fruits. A sore subject here. Fruits are very high in sugar. So when you eat a lot of fruit, your body gets a lot of sugar, which is acidic. You can say: “Oh, I can’t give up fruit!” You can eat a fruit, but in a small amount. If you’ve got some physical condition and you’re really trying to alkalize the body in the quickest way, if the body is really acidic, then you should eliminate fruit. Then when the body becomes alkaline, you can add fruit back, a little bit. And it becomes such a treat. Before, it was just a fruit. But now it’s: “Wow!” The exceptions of this are grapefruits, lemons, and limes. Especially lemons and limes are very alkaline in the body; grapefruits: it’s better if they are not too sweet. So, it’s good to add lemon to a lot of things: to your water, on your food, your vegetables. You can use it anywhere, all the time; it’s very, very good. Dairy products. Dairy products are pretty much neutral. They are about 7 on the scale (7.1-7.2). But they do create a lot of mucus in the body. Especially, if you eat too much dairy, which often people do. So, if you eat dairy, then don’t overeat, eat very moderately. Unfortunately, the dairy we get today is so contaminated! Again, in Krishna’s system everything was different. The cows were loved. They had fresh, nice, beautiful green grass to eat and they drank from clear, alkaline streams. So, obviously the milk they gave was very different. Now, our mother, the cow, is treated so bad. What can we expect to get from her? She’s tortured from birth till death. She’s fed a horrible food. They even grind up cow parts like the spines, and the brains, and others, put that in food, and feed it back to the cows; all the parts they don’t use (the “junk” parts). They turn the cows into cannibals eating their own kind! Can you imagine something more demonic than that?! They fill them full of hormones to make them to produce more. They fill them full of antibiotics to counteract all the diseases they got from that lifestyle. They are always under stress. So, what do you think the milk’s like? I can tell you: what the cows eat greatly affects the milk. When I was on the farm in the spring time, wild onions came up in the pasture. And the cows ate the onions. And the milk tasted like onions! You can understand: what goes in, comes out. So, when all this horrible stuff goes in, what kind of milk do we have? You’ll say: “Well, I’ll buy it from the babushka!” But you don’t know where babushka’s cow is, either. You don’t know where it is. You don’t understand what her cow is like, the life of her cow. A cow might be drinking vodka for a week! And at best, everything around the cow is polluted: the grass, everything. When we read in the Vedas about the wonders of milk, it’s absolutely true, but the milk today and then is completely different. So, we do the best we can and don’t overuse the dairy. Some people eat a lot of cheese. Cheese clogs the body, I can tell you. In Switzerland people eat a lot of cheese, right? We have a cheese guru here, a Swiss cheese guru. I was talking to a doctor in Switzerland who does colonic irrigation. That’s when you clean intestines with water from a machine. And this doctor had worked in other countries and said that he’d never seen so many clogged up intestines as in Switzerland from all the cheese! So, again: “I like it!” But what can I say? This is just the way it is. Sprouts are very, very good. In fact, of all the foods, sprouts are probably the best. You can sprout all the seeds (sunflower seeds, etc). You can sprout all kinds of beans. You can sprout grains. You can sprout wheat. All kinds of different things. When you sprout anything (beans, grains, seeds), their nutritional value increases many, many times. You can grow sprouts in winter, when it’s hard to get fresh vegetables. It’s very cheap, very nutritious, and very delicious. That’s a very good way to have an alkaline part of your diet. Nuts and seeds are also good. But it’s preferably to soak them overnight, then they are more digestible, they begin the sprouting process. Of all the nuts, almonds are the best. They are very alkaline and very nutritious. If you eat almonds, just soak them overnight and peel that brown skin off. Anything you read about almonds, they tell you to do that, whether it’s in Ayurveda or other health books. That brown skin is an enzyme inhibitor. It doesn’t let that almond to sprout. You can leave an almond on the shelf for 10 years, and it won’t do anything, it just seats there. But when you put it in the water to soak, it starts to sprout. So you don’t need that skin, you take it off. It’s recommended to eat at least 10 almonds a day. So, there is another nice thing to add to your diet. Peppers are good. All the different peppers: the hot ones, the sweet ones; they’re all good. The more raw food you eat, the better, because it’s the electrical charge in the food which really energizes the body. The main difference between raw food and cooked food is the electrical charge. The whole human body runs on electricity: every nerve, impulse, etc. This is an electrical spark, an electrical charge. So, the more raw food we eat, the more that recharges the body. Therefore, more energy, etc. The brain works clearer, everything is charged with electricity. When you cook the food, you kill the charge. But some cooked food is fine. That’s not a problem. But remember to try to get some good quota of raw food, as well. There’s another interesting thing about cooked and raw food. There are some foods like tomatoes. Of course, when you cook tomatoes, you kill the charge. And there are certain ingredients in tomatoes that you destroy when you cook it. But there are other good ingredients in tomatoes that you can’t get, unless it is cooked. So, what is the solution? You eat some raw tomatoes and some cooked tomatoes; then you get everything that tomato has to offer. These are the general ideas. This is the alkaline diet.